Welcome to Marvel Strike Force Guides page. This is the full description of MSF Raid segment with all information regarding it. Hello Marvel Fans, today we will talk about Marvel Strike Force Raid which is the most important segment of the game in my opinion. Raids are open when you reach level 25 and the goal is to beat a certain number of consecutive fights along the line you take on the Raid map. In order to complete the Raid, you will need the help of your alliance buddies because you can’t do it alone and for progressing in the Raid you are awarded ability materials which are essential for upgrading the skills of your characters (power of your heroes is mainly determined by the level of his skills). Currently, in game, we have Ultimus raids and from time to time and Foxnet introduce us with event raids such as Deadpool Raid and Thanos raid. For opening the Ultimus raids players from the same alliance must contribute Ultimus keys which are collected by spending game energy. One player can earn six hundred Ultimus keys in one day and it is very important that everyone collect all six hundred keys so the alliance can open at least one Ultimus raid per day. After finishing the Ultimus Raid player is awarded various rewards in relation with his damage contribution, raid progression and the level of the Ultimus Raid. Rewards vary from raids credits and already mentioned ability materials to two types of raid orb fragments. Raid credits are used for purchasing in the Arena Store, ability materials for enhancing skills and raid orb fragments for opening blue and purple raid orbs. There are 5 different Ultimus raids at the moment, which are intended for players of different levels – Level 25 Raid, Level 30 Raid, Level 35 raid, Level 40 raid and Level 50 raid but in the end only Level 50 raid is what it matters because when you level up you will play only that raid. Nevertheless, I will provide you with information about each raid. Level 25 raid is meant for low-level players who just started the game. Raid is built for only 3 players and it ends with Boss who have 12 k power. You need only 1800 Ultimus keys for opening this raid. What are Ultimus Raid Rewards? As you can see rewards are symbolic and the raid can be finished with a little effort. If you are in a random alliance it’s a good start and it is the way to learn basics about raid fights and raid team composition. Level 30 Raid is a little bit more serious and you will need 7 more alliance members to participate. It needs synchronization and raid planning if you want to have 100% success because raid will not be entirely finished if just one node is skipped. Level 30 raid has 35 nodes in total which means that 5 players need to clear 4 nodes and three other players 5 nodes. With a little coordination, it can be done easily and after one or two attempts u will realize that this raid is even easier than level 25 Raid. Opening this raid cost 2500 Ultimus keys. What are LVL 30 Raid Rewards? For level 30 raids you get T2 ability material (blue material) which is needed for upgrading your skill on level 3 and blue gear orb fragments used for opening blue gear orbs in Arena store. Level 35 Raid is built for two teams of eight players and it has 52 nodes. This means that you will need more than 1 login per day in order to finish it since every player must beat at least 6 nodes ( 1 fight cost 10 raid energy and you have a total of 50 raid energy by default). Power of nodes varies from 8k enemy power to 24k enemy power and there are 6 Bosses. It may seem a little bit difficult but when you are used to enemies in nodes it is not that hard. Opening this raid cost 6000 Ultimus keys. What are LVL 35 Raid Rewards? Level 35 Raid brings us significantly better rewards than Level 30 Raids but as you can see it is only a temporal solution before Level 40 raids and Level 50 raids. For Level 40 Raids we need a full alliance. Raid is built for 24 players and it has 36 nodes along with 7 Boss nodes. You may think that this raid is easier than Level 35 Raid since it has fewer nods but the team power of the nodes is much higher and it varies from 11k to 85k which is the strength of the last Boss. Alliance with players whose average team power is greater than 35k should be able to clear this raid with no difficulties. Feel free to use more than one team for clearing this raid because for some nodes you will have to attack with second-team first in order to make it easier for the first team. Opening this raid cost 10000 Ultimus keys. What are LVL 40 Raid Rewards? Rewards for level 40 Raid are great considering the effort needed for completing the raid. Players are introduced for the first time with T3 ability materials which are needed for leveling skills to rank 5 and 6. You get enough blue orb gear fragments to open blue gear orb after each raid and half the amount of purple gear fragments needed for opening purple gear orbs. Keep in mind that Tier 3 rewards for level 40 Raid are better than Tier 1 rewards for Level 50 Raid. 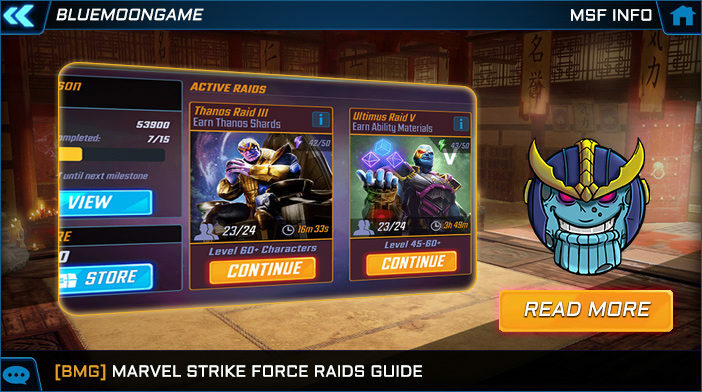 Level 50 Raid is currently the end game raid in Marvel Strike Force. Raid has 51 nodes along with 11 Boss nodes and enemy power varies from 22k power to 220 k power. It takes full synchronization of all members of the Alliance to complete this raid. Aside from synchronization, team power of all members of alliance needs to be high enough to endure clearing at least 6 nodes. From my experience, average team power of alliance members should be at least 75k in order to clear Level 50 Raid, although even players with team power of 50k can clear two or three easy lanes. It is important that everyone knows their job and to follow the orders of Alliance leaders and captains in order to avoid any possible problems. Remember – Greed is not good! At the moment there is one common strategy used by almost all alliances. You can see it in the picture below. What are LVL 50 Raid Rewards? Active Alliances can finish 3 levels 50 Raids in 2 days and that is the fastest way to improve the power of your whole roster. Rewards from level 50 raids give you enough ability materials to improve at least one skill of your heroes after each raid. You also get enough orb fragments to open 2 blue gear orbs and 1 purple gear orb at the end of the raid. After every raid, you are also rewarded with Raid Credits which can be used in the Raid Store. In the Raid Store, you can purchase raid orbs or supplies. There are 3 kinds of raid Orbs – Raid Orb which containing the shards of current raid heroes in raid supplies, Blue Gear Orb with the materials needed for blue gear and Purple Gear Orb with purple materials. In Raid Supplies you can purchase the random blue and purple gear materials and shards for various heroes and minions - currently Ronan the Accuser, Mercenary Soldier, and Ravager Stitcher. In the end, I will talk about the best team composition for raids. Unlike other game segments in Raids, you will need a character who can heal your heroes because your team transfers their health from one node to another so it is important that you have someone with constant healing ability. The obvious solution is Night Nurse but she isn’t the best choice. The best choice, believe it or not, is Mercenary Lieutenant. Mercenary Lieutenant has a 30% chance (when his passive is upgraded) to heal the most injured ally for 20% of his max Health, so basically every third turn you have free healing. He also has the ability to apply Offense Up and Speed Up on all allies every second turn. Above all this, he grants free energy to his allies on the attack. Pretty cool, isn’t it? I am also recommending Drax to be your tank because Drax automatically casts Taunt on the start of every fight. Your main damage dealer should be Deadpool because he is a mercenary (Mercenary Lieutenant has bonus heals for mercenaries) and because he has bonus damage against minions. If you don’t have Deadpool, Gamora is also a good choice since she has extra attacks after kills. Best controller is definitely Quake at the moment although Hawkeye is also a nice choice but not as good as Quake. The fifth character in your squad should be someone with summoning ability. Both Kingpin and Yondu are good choices but Yondu has an AOE attack and he can debuff enemy targets. If you prefer you can replace Drax and Mercenary Lieutenant with Captain America and Night Nurse for the almost same effect although I have a better experience with the first mentioned duo. Keep in mind that some heroes like Crossbones are not efficient in raids like in Arena and Blitz because the goal is to endure as long as possible without healing (you can always use Crossbones in one particular node, but for the whole lane rely on other heroes). My final advice is to learn all the fights in your lane and to save your important skills for the right situations instead of using them when you don't have to. I hope you found this guide helpful. If you have any questions or you want to share your ideas with me feel free to write. If you like this guide you should also read the Blitz guide and the Arena guide. We hope that you enjoyed the description of MSF Raid segment. For detailed information about other MSF Segments check our MSF Guide page.